Level 11 (minimum, will only net 3,000,000) Wizard, with max ranks in Weaponsmithing and the spells Wall of Iron and Fabricate. Cast Wall of Iron, creating a wall 55ft5ft2in=45.83cu ft of iron. This step costs 50gp in material components. Cast Fabricate, converting 11 cu ft per cast into masterwork daggers. With 14 ranks in Craft (Weaponsmithing) and a wizard’s crazy Int, you can’t fail. Repeat until only 1-2 cu ft of iron remains. (4 casts). This consumes your 5th-level slots for the day, and takes 4 and a half minutes. The density of iron is 491lbs/cu ft. Thus 44 cu ft of iron weighs 21604 lbs. A dagger weighs 1 lb. Thus we create 21604 masterwork daggers, which sell for 151 gp each. That’s 3,262,204 gp. Over 3 million gp. At level 11. The spell description reads “You convert material of one sort into a product that is of the same material.” therefore should any DM give you grief about singularity, connect each dagger by a thin thread of metal that can easily by clipped or removed after creation, thus giving you the countless daggers you were looking for. Folding the line of daggers may help conserve space for the plethora to-be. Teleportation will solve the economic problems; by selling to the entire world instead of just the local pawnshop, you can possibly find a market. And then spend your money to set up lots of local branch offices, with people capable of casting Sending or whatever to keep you informed of how business is going and what local demands are. Use this to track warfare and sell your weapons wherever they are needed. You probably won’t be able to sell the maximum output of a level 20 wizard, but you’ll make a very, very good profit, not to mention a lot of friends in high places if you sell at a bit below normal price. This assumes you don’t flood the market or somebody casts dispel magic on the daggers. 20th level wizard, without using any slots above 6th level. Volume of Iron = 5520*(5/12)=208.33cu ft.
Mass of Iron Fabricated = 200491=98200 lbs. Profit = 14,827,700 gp. Per day. You cannot make masterwork quality items him this fashion. to be fair (ta be faihhhh) as a GM i’d prolly allow a caster that had all the requisite skills AND the proper materials to use the fabricate spell as a magical SHORTCUT if he wanted to turn a pile of masterwork-grade hardened steel bars into bare sword blades. use another to premake crosspieces and/or unwrapped hilts. mebbe even allow him to take high-grade uncut gemstones and fabricate them into cut and shaped stones, provided he had the trained skills to do so. You can make a masterwork item—a weapon, suit of armor, shield, or tool that conveys a bonus on its use through its exceptional craftsmanship, not through being magical. To create a masterwork item, you create the masterwork component as if it were a separate item in addition to the standard item. The masterwork component has its own price (300 gp for a weapon or 150 gp for a suit of armor or a shield) and a Craft DC of 20. Once both the standard component and the masterwork component are completed, the masterwork item is finished. Note: The cost you pay for the masterwork component is one-third of the given amount, just as it is for the cost in raw materials. 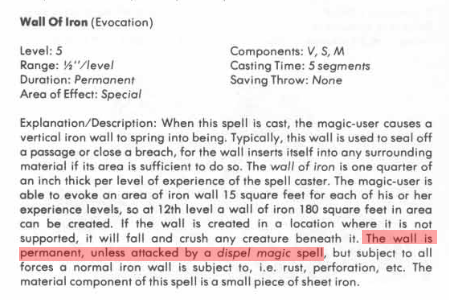 My interpretation of Wall of Iron is that it is permanent, not magical after summoned. But read the SRD version of the spell. 1e, specifically called this out. 2e is the same as 1e. But the 3.0, 3.5, and SRD version specifically does not have that highlighted section. Also found where @orc got the idea.